• Elderly director Kinji Fukasaku, who helmed the original Battle Royale and countless other films over his storied career, died shortly after the filming of Battle Royale II commenced. Diagnosed with cancer before shooting began, he decided to go ahead and concentrate on the sequel anyway. 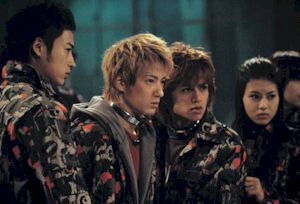 After his passing, his son Kenta, whose original idea inspired Battle Royale II, took over directing duties. 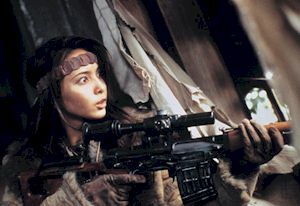 • Ai Maeda, the actress who plays Saori Kitano, is actually the sister of Aki Maeda, who played Noriko Nakagawa in both Battle Royale and the sequel. 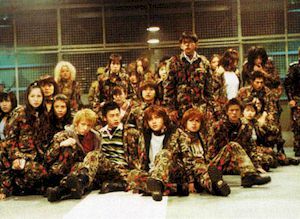 • Ai Iwamura, who played the smiling, bloodied winner seen in the opening moments of the original Battle Royale, appears briefly in Battle Royale 2 as a member of Wild Seven. • Sonny Chiba has a brief cameo as the uncle of Mimura, the computer whiz from the first Battle Royale. As detailed in various other media (the comic book from Tokyopop, the translated novel from Viz), Mimura's uncle was a self-proclaimed revolutionary who fought the good fight and taught Mimura everything he knew about sticking it to the man. Sadly, Chiba's screentime barely musters a minute. The Skinny: Technically sound and at times involving, this sequel to the cult 2000 hit ends up not being like Battle Royale at all. Some thinly-veiled post-911 commentary gives this flick some bite, but overall this sequel is gratuitous and even a little silly. Back in 2001, the original Battle Royale dropped onto the Asian film community like a cinematic megaton bomb. At once a nail-biting action thriller, an over-the-top satire on the reality TV craze, and a veiled commentary on Japanese society, the film hit a chord with audiences worldwideexcept in the United States, where it has been relegated to import DVDs and "Have you seen this flick?" party chatter. America's decision to stay out of the Battle Royale party was understandable. After all, the film's very premiseforty-one junior high students are dropped onto an island with random weapons, and asked to kill one another before three days are up, or THEY ALL DIEis something that wouldn't fly in a post-Columbine world. Bad enough that the film was about kids killing one another; heaven forbid that anyone imply that it's adults who condone and even promote the killing. Media powderkegs seldom come supplied with shorter fuses. 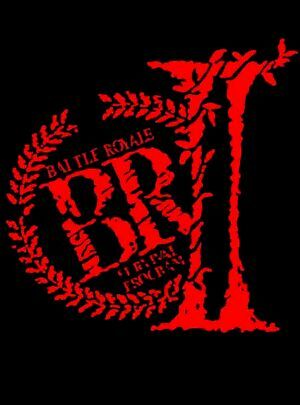 Enter Battle Royale II, a sequel which may one day typify the statement, "The sequel was unnecessary." Instead of the first film's enclosed reality show environment, the events of BR2 are painted on a larger, potentially more explosive canvas. Shuya Nanahara (Tatsuya Fujiwara), one of the two survivors of BR1, has become a wanted criminal for his terrorist activities as the leader of Wild Seven, a terrorist group made up of disaffected youngsters and other Battle Royale survivors. Wanted for the wanton destruction of several metropolitan buildings (two of which eerily resemble the Twin Towers), Wild Seven has since become the worldwide bad guys du jour. To combat their existence, the Japanese government have created Battle Royale 2, which isn't the film, but a new "game" designed to set teenager against teenager. 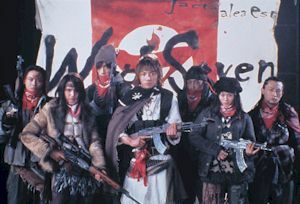 The kids are kidnapped like in the first film, indoctrinated by their complicit instructor Riki Takeuchi (played by V-Cinema kingpin Riki Takeuchi), and bullied into taking arms against their fellow post-pubescents. However, the rules have changed. Instead of offing each other, the kids are sent to the island retreat of Wild Seven with the following mandate: kill Shuya Nanahara before three days are up or everyone will die via their stylish explosive collars. True to the original game, the collars are set to explode when tampered with, or when the wearers stumble into pre-determined "danger zones." One new rule is an assigned partner, who will get offed via collar if you get offed via any other methodtwo for the price of one, if you will. Why such a harsh penalty is instituted is anyone's guess, but it makes for more blood and exploding throats than anyone could possibly want. Battle Royale II ups the violence considerably from the original, and as the kids storm the beaches of Wild Seven's stronghold (ala Saving Private Ryan), the players start getting dropped left and right. Wild Seven apparently has no qualms offing fellow BR participants, but in truth they haven't figured out that the kids rushing to their doom are sequels to their previous exploits. Eventually, the BR2 team will come face to face with their quarry Shuya Nanahara, which begs the question: will it be BR1 vs. BR2? Or will they join forces to take down the mean adults, who should really find less expensive ways to punish their wayward youth? Or will they just sit around and talk for two-plus hours? Sadly, other than the first half horrors and a climactic action sequence, the kids do sit around and talk for far too much time, which is where Battle Royale II eventually falters. The first film, while questionably realistic or even dramatically sound, had one undeniable hook: its kids-kill-each-other scenario could affect in untold ways depending on who was watching it. The kids were types, but recognizable ones, and the issues that arosetrust or betrayal, friendship or survival, complicity or rebelliongrabbed each individual in myraid different ways. Much of what could be gleamed from the original BR depended on what you brought to the table, and though not everyone enjoyed the film, you'd be hard pressed to find someone who didn't come out affected by it. The same cannot be said for BR2. The deaths of the kids happen too quickly, and in an escalatingly gruesome fashion. When they finally meet Nanahara, there really is no need to count who's dying and how many are left; all tension as to who offs whom has been completely done away with. Instead, we get soul searching on a variety of subjects. Nanahara's terrorist tactics should be appealing to some of the BR2 participants; will anyone defect? Saori Kitano (Ai Maeda), daughter of dead teacher Kitano (Takeshi Kitano from the first BR), volunteered for BR2 to meet her father's killer; what's her damage? The world nations, and one nameless superpower in particular, want Wild Seven taken out, even at the cost of common sense or traditional diplomacy; will Japan cave to the Western bullies? And what about the minor romances of the BR2 team? And why the hell does Riki Takeuchias Riki Takeuchi, mind youstart chewing up amphetamines and overacting egregiously? 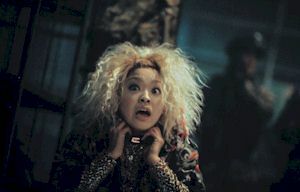 The answer to that last question is obvious: this is Riki Takeuchi, who can't do anything but act up an unnecessary storm via yelling and funny faces. As for the rest of the film, it's hard to say exactly what buttons the filmmakers were trying to pushexcept the obvious post-911 one. A central conceit of the film is its implication of a certain world power in its military diplomacy, or debatable lack therof. Nanahara's Wild Seven is a terrorist organization not unlike the ones you read about in the morning paperdoes getting into their heads tell us anything about what's going on in the world today? There are flashbacks to war-torn countries (Afghanistan? Iraq? ), where the overriding sentiment seem to be this: kids will smile no matter where they are. Is Nanahara a visionary or a perpetrator? Are the choices the kids make damning or heroic? And again, does all this make for a good film? The easy answer: no. 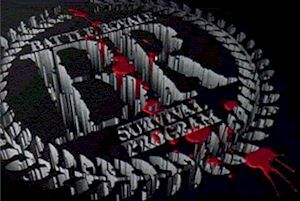 Unlike the first Battle Royale, there is no solid dramatic element for the audience to latch onto. Battle Royale 2 is certainly technically impressive, and there is a visceral feel to the blood and guts that gets spewed across the screen. But to what end it all happens is totally debatable. It's possible that a second or third viewing could solidify what BR2 is trying to say. Then again, multiple viewings could simply support what the film initially appears to be: a soggy mishmash of undercooked and overdone acting, uninspired personal drama, and questionable socio-political rhetoric. Even if the content strikes the occasional chord, that doesn't mean the movie is good.